Altergy’s Freedom Power technology is the revolutionary breakthrough behind Altergy’s clean, reliable, on-demand fuel cell solutions. Altergy’s patented design eliminates fragile, precise, expensive parts and complicated assemblies typically found in fuel cells, and instead leverages rugged, low-cost components in the first automated fuel cell assembly line in the world. Created from a fundamentally different approach, Altergy’s modular design delivers the lowest cost, most scalable and rugged fuel cell solutions available. Patented compliant contacts – Radically new method of making contact between bipolar plate and membrane electrode assembly ensures superior current collection, robustness, scalability, and ease of manufacture. Stainless steel plates – Altergy Freedom Power technology replaces graphite and other fragile components used in conventional fuel cells with stainless steel and highly durable components able to withstand severe environments. 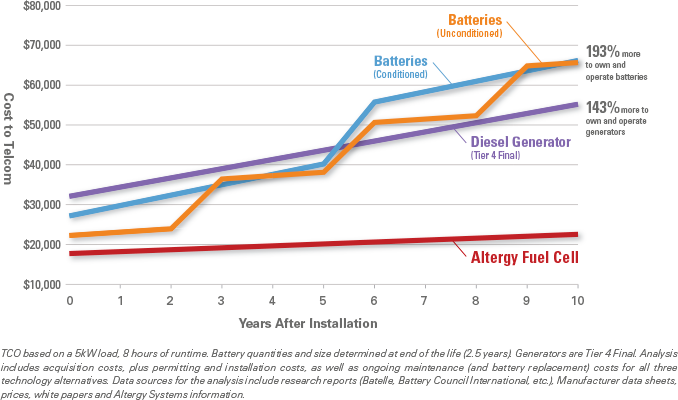 Altergy fuel cells have provided uninterrupted power where legacy systems have failed. Lightweight, compact footprint – Freedom Power technology can be deployed on rooftops and tight spaces where batteries and generators cannot. Fast start-up and extended runtimes – Freedom Power technology powers-up in about 10 seconds and can provide from hours to months of continuous operation on a single fuel fill-up. Altergy’s Freedom Power technology has replaced batteries and generators in more than 8.3 million watts of applications, logged more than 32 million hours of runtime, and even provided reliable backup power in extreme hot and cold weather and environmental conditions. Altergy’s Freedom Power technology’s patented design can reduce total cost of ownership by about 60% or more compared to legacy technologies. Altergy’s Freedom Power technology solutions have a design life of more than 20 years, and maintenance is simply cleaning or replacing air filters once per year. Integrated membrane bonding. Altergy eliminates gaskets and seals by bonding membranes directly to steel plates within the cell stack. Energy-efficient flex-plates. Freedom Power technology employs flex-plates to maximize electrical contacts, improve energy efficiency, and eliminate the need for expensive, high-precision machine work to produce the perfectly flat surfaces required to create intimate contact with membranes in traditional fuel cells. Automated assembly. Utilizing durable components and common stamped and molded fabrication techniques, Freedom Power technology leverages automated robotic assembly, yields higher volume output, and delivers lower cost-per-unit performance than manually assembled conventional fuel cells. Extreme scalability. With modular subassemblies, Freedom Power technology is inherently scalable from a manufacturing perspective and can be scaled in size to almost any application.